I believe that the switch this past weekend to Daylight Saving Time makes an intrinsically interesting blog topic. My wife disagrees and (after hearing a number of interesting comments about DST) asked me to please never bring up the subject again. At first this caused me to second-guess my original idea, but then I remembered that many women will happily spend hours discussing shoes or makeup or equal rights or whatever, and that interests will vary wildly from one person to the next. Maybe somebody out there is interested in how man measures time. The first day of Pacific Daylight Time, Sunday, wasn’t too bad. It was a rainy day and my family followed the example of our oven’s “Sabbath Mode” and didn’t engage in any real activity all day. The exception was me running around changing all the clocks, watches, and time settings on various electronic devices. It’s crucial to update every single one, because during the transition, every timekeeping device is already suspect. If two timekeeping devices differ, more trust is lost. This isn’t really fair. Logic dictates you should simply believe the clock that shows the later time. But then, logic isn’t always available in my household, especially when people are groggy. I get a lot of “What time is it really?” I also get a lot of “What time should it feel like?” I can relate: it should feel an hour earlier than it (officially) is, but instead time just feels off. Last night, 10 p.m. should have felt like 9, but instead felt like 11. This morning, 7 a.m. should have felt like 6, but actually felt like 5. All told, I changed the time on some two dozen devices in my home. I adjusted ten or so clocks (including the ones in appliances); two cameras; three phones; two cell phones; two bike computers; four watches; the thermostat. I thought I was done but now realize I didn’t get my wife’s MP3 player; the car clock; the answering machine; the drip irrigation system; the outdoor lighting system. Other exceptions will surface. Today, Monday, was rough. Everybody at home was dazed this morning, our routine a shambles. At work, an 11:00 a.m. conference call threw people into a tailspin because the recurring appointment had been set up in the e-mail/calendar program by somebody in the Arizona time zone, where DST is not observed. For those outside Arizona, the call automatically jumped forward by an hour on our electronic calendars. 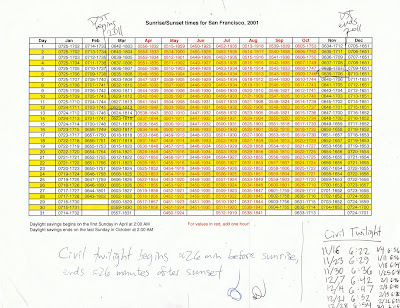 For example, in San Francisco, Pacific Standard Time switched to Pacific Daylight Time so the call was bumped to noon; even past iterations of the call show up in our calendar software as having been at noon. To the person who set up the call, everything seemed normal, but we had to decide whether to move the call or not. After a dozen instant messages among colleagues across three time zones, we compromised on rescheduling today’s call for 11:30 a.m. PDT. We do this little dance twice a year. The guy in the taco truck was also a bit off his game (whether for DST reasons or not). The gal ahead of me in line ordered a burrito and he said, “Hot or spicy?” She paused. “Excuse me?” she asked. “Sauce: hot or spicy?” he repeated. She must have had her coffee because she deftly slipped between the horns of the dilemma by saying, “Mild.” Only then did he grasp his goof. Before I go around changing clocks I like to be reassured that the time change actually happened. I could look at a PC for that, but would rather not. My brother, a software developer, once got burned by a commercial calendar program he wrote, because Windows 95 (which had just come out) adjusted to DST automatically, whereas previous Windows versions had not. This meant that my brother’s software, which adjusted automatically to DST, messed up all the Windows 95 users through an unforeseen “dueling automated DST adjustment” scenario. If that’s not fun, I don’t know what fun is (and really, maybe I don’t, despite posing as an authority on the subject). But take heart, there is another benefit to this adjustment period: if you wish you had the stamina to stay up later, or that you had an easier time sleeping in on the weekends, this time change should help for awhile. There are plenty of opponents of DST, such as End Daylight Saving Time and Mothers Against Daylight Savings Time, but you have my permission to ignore them because they’re all silly. Anybody who questions the need for DST should explain to us why we should desire a 4:46 a.m. sunrise, which is when it would happen in mid-June were it not for DST. (That holds for the Bay Area. The farther north you go, the more absurdly early this sunrise would be; my brother in Bellingham, Washington would have a 4:06 a.m. sunrise without DST. You can create a handy sunrise/sunset chart for your own area by visiting this cool website). I’m a lifelong morning person but even I have no use for such an early sunrise. Other than a few certifiable whackos, and people with really weird schedules (e.g., the West Coast financial industry folks who have to be to work before the markets open on the East Coast), nobody gets up this early. 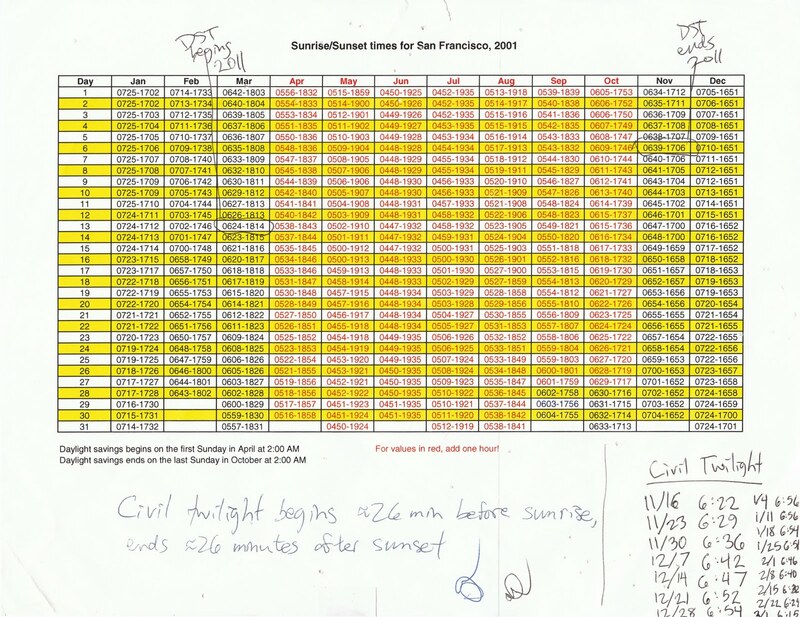 And yet the latest sunset that DST gives us—8:35 p.m. in the Bay Area—seems completely reasonable. On the longest day of the year the sun still sets before my younger daughter’s bedtime. Somebody will want to speak up about the farmers. But why? How big a subset of the workforce are they, really? And if they were to hold out in silent revolt and stick to standard time year-round, I doubt anybody would care. Perhaps they already are ignoring DST. When should DST begin and end each year? This is a much more complicated question. Today, the sun rose at 7:22 a.m. in Berkeley. That’s pretty dang late when you’re trying to get your kids up at 7:15. It also means there’s no chance of a morning workout unless you want to drive to the gym in the dark or ride the indoor trainer (which most of us here are pretty sick of by now, this having been a cold and wet winter). On the other hand, the sun didn’t set until 7:15 p.m. this evening, and I’m sure people like that. Though I will miss the morning light, this change does make a short evening bike ride more feasible. The reason the American government gave for extending DST was energy savings. It’s not obvious to me that anybody has studied this closely enough; it’s also not obvious to me that this is the most important rationale. I’ve read that DST curbs violent crime, since violent criminals aren’t morning persons. (I’m paraphrasing here.) That makes sense and seems pretty important. Naturally, I wish government policy was aimed squarely at what would most benefit me and my bike riding schedule, but that’s not going to happen until one of my kids takes power. In the meantime I guess I’ll accept whatever the government gives me. What else can I do? This year, Russia is doing something new: in the fall, they won’t switch back to Standard Time. That is, they’ll stay on DST forever (or until their next major political upheaval). In a televised announcement of the change, Russian President Dmitry Medvedev declared, “I believe this will be interesting.” In describing the past difficulty of switching the clocks forward and back every spring and fall, Medvedev (or at least his translator) said, “I won’t even mention cows and other animals who don’t understand why milkers come at a different time because of the time change.” How true that is. Good luck with that, Russia! One thing is for certain: here in the U.S., we can say goodbye to that handy “spring forward, fall back” mnemonic, since the time has already changed and its not even spring yet. “Winter forward, fall back” isn’t nearly as memorable and doesn’t even make sense. During the day the most flattering lip tone will be one shade darker than your natural lip color. Between civil twilight but before dark you can get away with two shades darker. After dark you can pull off a more saturated hue. To test shades, apply lipstick or gloss to one lip. If that color is just a shade or deeper than your bare lip, then you’ve found your daytime shade; go one darker right at sunset. But even though DST has begun, it’s not yet spring, so err on the conservative side, especially if your suntan is gone. Many women wrongly believe they can’t wear red lipstick before dark. The secret to choosing the right red lip color is breaking the day into temporal zones as described above. Deep plum, chocolate or red is fabulous in the wan winter gloaming, and then you can shift to a wine shade after dark.